INVENTIVE BELFAST solo artist Duke Special’s latest album is imaginatively different even by his standards. Peter Wilson – a mainstay of Northern Ireland’s boisterous music scene – has long drawn influence from his surrounds. These include an album based entirely on a Paul Auster novel, and another based on the work of famous photographers featured in the New York’s MMA. Wilson jokes that his latest release, is influenced by “gardening,” (a genuine love of his) but quickly gets down to the real detail of forthcoming ninth album ‘Hallow’: putting to music the poems of popular Belfast writer Michael Longley. Wilson is being typically modest: under the Duke Special moniker he’s become a stunningly delicate performer, basing his style on intricate and smartly-charming piano tracks, soulful, honeyed vocals, and a turn of phrase Longley himself would no doubt appreciate. Much like his earlier work – check out hit singles ‘Freewheel’ and ‘No Cover Up’ to get a feel – ‘Hallow’ very much draws from the old school of music. It’s written almost entirely around piano and vocals. 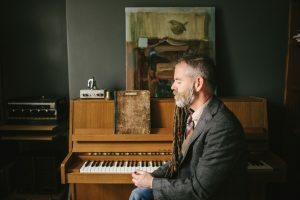 Sure, Wilson layers in plenty of other instrumentation such as double bass and guitar that he describes as “layered and embedded around” the main tracks, but the heart of his music is very much one man, one great tune, and a piano. In truth, Duke Special doesn’t fit naturally into the Irish music scene. He totally eschews current fashions – something that’s always been more of a positive than trying to adapt to them – and has a wonderful habit of making much from the pieces of art that absorb him. He tends to sing in fantastically phrased near-riddles that just ooze inventive songwriting. 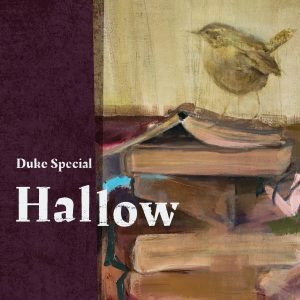 Hallow is out on Friday, October 6, while Duke Special plays Draíocht Arts Centre, Blanchardstown on October 14 as part of his Irish tour. This article is one of my weekly music columns for the Dublin Gazette, reproduced here with permission. Note: this column is published in the Dublin Gazette several days ahead of on this website, so at times, some columns may be slightly out of date. The Gazette is a freesheet paper available across Dublin, published on a Thursday. Pick up copies at these locations.